You know how convenient it is to have a garage door opener. It allows you to easily open the door while you stay comfortable inside your vehicle from season to season. When it malfunctions, though, you're forced to get in and out of your car to open and close your overhead door. Unless you like doing this, you'll want to have your garage door repaired as soon as possible. Discount Garage Door Repair quickly responds to your request for garage door opener repair in Frisco, TX. We have the knowledge, skills, and tools to give new life to your faulty garage door opener. Your garage door opener plays an important part in raising and lowering the door, but it doesn't operate alone. Counterbalance springs and cables actually do most of the lifting. The opener basically determines how much your garage door will open or close, and it also keeps the door in place when it is closed. 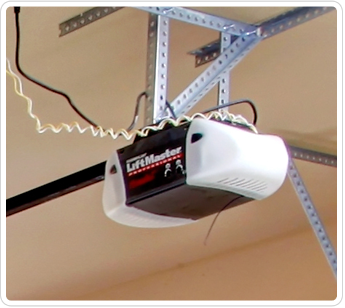 A garage door opener is a device with multiple components. Most of the time, the power unit that contains the opener's motor is attached to the ceiling at the back of the garage. The unit is connected to the top of the garage door by the arm of the trolley. When the trolley moves back and forth, the door goes up and down. Limit switches determine how far the overhead door actually opens and closes. With this type of complexity, it's obvious that just about anything can go wrong with your garage door opener. When repairs won't fix the issue, we recommend replacing the door. Rely on our technicians to perform complete garage door opener installation. We use LiftMaster and Genie products because of their durability and lasting quality. Quiet operation and user friendliness are just two of the benefits that come with any of the openers we install for you. We will also include garage door opener installation with garage door installation at your request. Sometimes the problem isn't with the opener itself, but the remote you use with it. If you haven't changed the battery in a while, try that and see if it works. If not, your remote may need to be repaired. A remote that doesn't respond to either of these services probably needs replacing. To replace garage door remote equipment, we just do a search of the brand's product listings. When we find a compatible remote, we order it for you. Contact us for garage door opener repair that jump-starts your equipment's performance. We proudly serve Frisco, Plano, Mckinney, The Colony, Prosper, Aubrey, Lewisville, Little Elm, and Allen, TX and the surrounding areas.